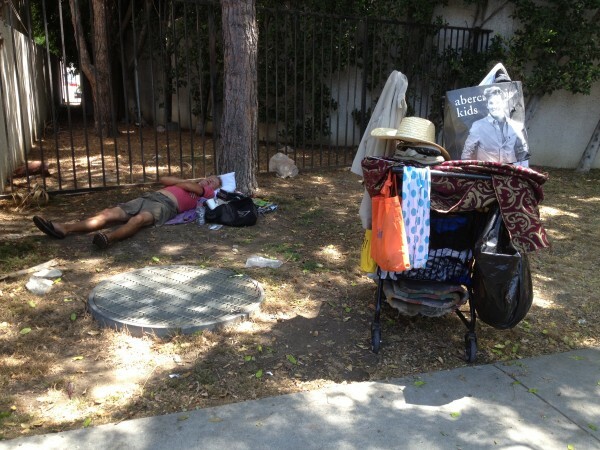 A homeless person with a cart full of belongings sleeping on WeHo’s Eastside (Photo courtesy of Roxanne McBryde). Several West Hollywood City Council members last night called for a more aggressive to the city’s homeless, citing a perception by the community that there has been an increase in aggressive and offensive acts by homeless people. Kisu Brady Brown (Photo from 7-Eleven security camera). Councilmember Duran also asked whether the Sheriff’s Station could remove belongings that homeless people leave on the sidewalks. Capt. Sergio Aloma said the situation is complicated because of a 2014 lawsuit brought against the Los Angeles Downtown Industrial District for removing unattended belongings of homeless people on L.A.’s Skid Row. Those belongings sometimes were taken while individuals left for short periods to go to a doctor’s appointment, get a meal or use a restroom. The Los Angeles City Council earlier this year approved a settlement that barred such seizures unless the property is obviously abandoned. Aloma said Sheriff’s deputies would have to pick up such property and put it in storage in the event the owner came to retrieve it. Councilmember Lauren Meister also said the city seems “to be having a growing population of homeless who are aggressive. From the feedback that I’m getting from the public, we’ve had break-ins, we’ve had homeless defecating on private property and on the street, we’ve had physical injuries, attempted murder. We’ve had people passed out on sidewalks and walkways and door entry ways and we have substance abuse and trespassing. One incident cited in last night’s discussion was the Sept. 5 attack by an apparently homeless man on another man outside the 7-Eleven convenience store at 7950 Santa Monica Blvd. The alleged attacker, Kisu Brown, is in custody on a charge of attempted murder. Brown, 41, has a long history of arrests in Riverside and Los Angeles counties and, while apparently homeless at the time of the WeHo attack, once lived at 920 Orange Grove Ave. according to a WEHOville source. Brown also has been photographed recently driving a car in the Hollywood Hills. City Councilmember Lindsey Horvath expressed concern about homeless people inhabiting empty buildings, some of which are planned for demolition. “We need to work with Building and Safety to address nuisance properties that we have identified as refuges for some of the activity that we’ve heard described here tonight,” Horvath said, referring to the city’s Building & Safety Division, which is responsible for enforcement of the city’s building codes. Horvath that that “in some extreme cases where we know the properties are going to be redeveloped” the city should consider allowing them to be demolished immediately. Homeless people being escorted from 1207 N. Detroit St.
Heilman said that he has been in conversations with L.A. County Supervisor Sheila Kuehl, whose fifth district encompasses West Hollywood, about the issue of homelessness, which is something the entire county is struggling with. He said Kuehl is supporting outreach for mentally ill homeless people in Santa Monica who resist help and would consider supporting a similar effort in West Hollywood. He said Los Angeles County also plans to open its armories, which can be used to house homeless people, 24 hours a day. Heilman said Kuehl is working on ideas for letting the county take action with homeless people who decline help but are an immediate danger to themselves or others or have committed a crime. Currently it is difficult to force such people into a shelter or treatment or arrest them,” he said. Aloma said those arrested likely will be back on the streets soon. And doing that robs deputies of time they should spend investigating more serious crimes. “For every deputy sheriff you take off the street that has to spend time transporting, booking, writing reports, all the paperwork that goes with that, that deputy sheriff is off the street and not paying attention to car burglaries and other crimes,” he said. What is the City of West Hollywood doing about homelessness? Click here and here for the first two in a series of four articles outlining the steps the city is taking to address this complex countywide issue. Beverly hills is more conservative then west Hollywood that’s why there is less homeless. Make it illegal to be homeless. These people are mentally ill and unstable & a threat to us all. These cycles are not helpful to ANYONE. @Dacey…YES! and @ Ann V. YES!, YES! The Homeless isn’t just a problem in our city, it’s county-wide. I would hope that out elected officials find a way to address this issue realizing, that whatever we do, doesn’t amount to much if our neighbors in L.A., Beverly Hills, Santa Monica & Culver City, just to start with will not work together. Get rid of the garbage and shopping cards and they will soon leave. Aren’t there Vagrancy laws and others that can be used for this…I’m surprised that the merchants on the street are not attacking city hall over this. Give then signs saying ..NOT GET THE STREET PEOPLE MONEY OR FOOD… it just keeps them here…..they are always asking me for a dollar and I’m tired of dodging those over loaded shopping carts they push on the sidewalks…PLEASE GET RID OF THEM!!!!. People have to stop calling these people THE HOMELESS…they are PROFESSIONAL STREET PEOPLE that come from the freezing mid-west…I’ve live here for over 25 years and it’s so sad that the city has improved the city just to have these people take it over and destroy it…I’m tired of being accosted by them since I walk SM Blvd. every day and they are getting aggressive as they move into the residential areas. The enclosed bus stops are filthy from them eating and sleeping in them. Elderly people tand in the sun because the S People are sleeping in them. Happy to hear that this issue is finally becoming a priority for the city. I was very encouraged by the excellent comments, questions and call for action offered up by Council Member John D’Amico and Mayor Pro Tem John Duran. I also appreciated Council Member Lauren Meister’s understanding of the issue. John D’Amico referred to the broken window theory. That also applies to people’s lives. Let’s not continue to allow the unacceptable to become acceptable. I’m waiting for a handicap individual(s) to file a lawsuit regarding blocked sidewalks! It has to be against the law to block at wheelchair bound person from accessing the sidewalk. If someone’s belongs are there for more than a day (and even that’s too long), it should be removed!! Another thing we can do to deter homeless from coming into out City is to get the PAVILIONS RECYCLE CENTER CLOSED! This draws the homeless from all over and the Norma Triangle -in particular -is feeling the negative effects of its presence. When a homeless person commits a crime that should be mentally evaluated and if found mentally ill, they should be placed in a mental health facility (not jail) where they can get the treatment they need to get mentally well while being provided food and shelter. That would be tax money well spent and not throwing good money after bad. The City of Beverly Hills has less homeless in part to their pro-active business campaign. Most business have in their windows/doors a sign that reads (not quoting)..don’t give handouts to beggars, donate to organizations that actual help them. If you give money to them, they will most likely stay on the street longer. Everyone has compassion for the homeless but a little tough love goes much further in turning their life around. The vast majority of homeless that I come across on a daily basis just walking the boulevard by my home are obviously mentally ill or addicts of some nature. I don’t believe you mentioned that some are also on the streets by their own choosing not interested in working for a living, or being a proactive, responsible adult. People giving them handouts (like it is mentioned in the article) does them more harm than good. If people want to give money, they should give donations to a local organization that helps gets the homeless the mental health treatment they need while providing shelter and food. Since there’s a hepatitis outbreak, bleaching the sidewalks would be a good start. The homeless relieve themselves on the side of buildings, on grass and staircases, in bushes etc. and it all ends up on the sidewalks. I hold my breath as I walk along SMB in many parts. Pedestrians are tracking all of this on their shoes and into their homes.